Do you think your PC has viruses? If yes, then try Microsoft Safety Scanner. It is a free antivirus which is downloadable and provides on-demand scanning and helps remove viruses, spyware, and other malicious software. It works with your existing antivirus software. The Microsoft Safety Scanner expires 10 days after being downloaded. 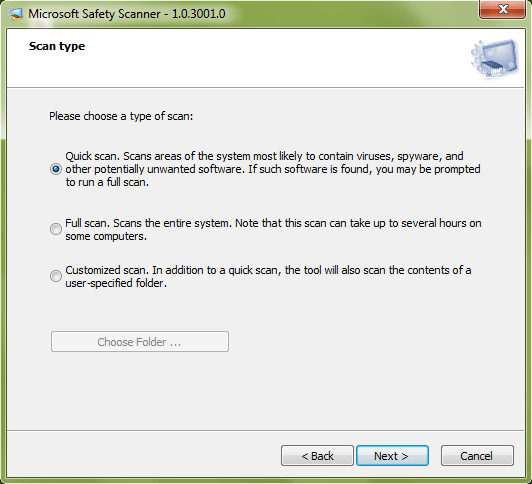 To rerun a scan with the latest anti-malware definitions, you need to download the Microsoft Safety Scanner again. It is not a replacement to your antivirus because it does not work in real time. Note : This is strictly not a replacement to your anti virus and is just to be used for additional tests for viruses. Do not delete/uninstall your anti virus before/after using this tool. A new copy of the software is to be downloaded after every 10 days of previous download in case you need to again run the scan after the 10 days of expiring period.